After watching Elon Musk's presentation regarding the Tesla Powerwall, I had a question. On his diagram of the USA, he claims that a "tiny blue square" on the top of Texas that consists of solar farms would be enough energy to power the united states. I've watched documentaries, that claim it should be 10 times that size. This seems absurd right? Calculations below are taken from this blogpost at the Energy Institute, University College London. As Thales Pereira has pointed out in the comments on the question, the claim could be taken to mean that that area of PV would displace fossil fuel, and supplement the existing zero-carbon options on the US grid (hydro, nuclear, wind). That would make it an slightly weaker claim. I've assumed that it's the strong version of the claim: that that area would be the same amount of power as total US demand, even before considering existing hydro, nuclear and wind generation. If the stronger claim is valid, then the weaker claim automatically follows. Which is more than current US electricity consumption of 425 GW. So yes, the area shown is reasonable, as a visualisation of the surface area of panels required to generate electricity equal to total US electricity consumption, on a multi-year average. 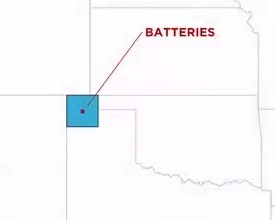 Firstly, the northern 55 km of the square is the Oklahoma Panhandle, while the remainder is the Texas Panhandle, which is 270km east to west. The blue square is therefore about 123km on each side, 15,000 sq. km. or 3,700,000 acres. A great resource for evaluating whether this is sufficient is Land-Use Requirements for Solar Power Plants in the United States by the National Renewable Energy Lab. According to table 4 (which considers only direct land use) the most efficient use is by 2-axis concentrating PV systems, which need only 2 acres to produce a GWh per year. So with 3,700,000 acres, 1,850,000 GWh can be produced per year. This compares to 4,686,400 GWh per year in electricity consumption for the USA as of 2013. So, no, even considering the best current technology and only direct land use, it is not a large enough area. Not the answer you're looking for? Browse other questions tagged united-states electromagnetism energy . Can the US be powered by a 100 miles x 100 miles solar grid?